Chad, a successful professional angler and fishing guide from Holt, Michigan, will be using a Troll Perfect on his boat during the 2013 season. 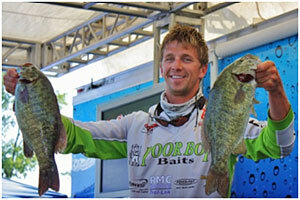 Chad has gained entry to the Bass Angler Sportsman Society Elite tournament trail by winning the 2012 Northern Opens points competition, and will be a contender to watch. He has acquired the necessary skills and talent to compete on any body of water in any part of the country. “I am very excited to join the Troll Perfect Pro-Staff and eager to put the product to use! Anything that makes my job easier and allows me to focus more on my fishing is extremely valuable,” says Chad. Troll Perfect is a device that controls the torque generated by foot controlled electric trolling motors. For more information, call: 248-747-8520, email to: trollperfect@live.com, write to: Perfect Outdoor Products, PO Box 70551, Rochester Hills, MI 48307, or visit the website: www.trollperfect.com. Contact Chad Pipkens, professional angler and guide at: www.chadpipkens.com.